Intended for bolus feeding, administering medications, or flushing the MINI™ balloon Button. Designed for capsule Dome G-Tube and capsule Monarch® G-Tube. AllegroMedical.com presents The Y-Port Feeding Adapter. Y-port used along with right angle feeding set is used for continuous feeding. 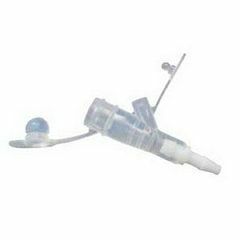 The catheter tip syringe fits into the bolus port of the bolus feeding set and the feeding port of the right angle feeding set. It is intended for bolus feeding, administering medications, or flushing the MINI™ balloon button with warm water. great fit and great ptice. easy to put on my feeding tube, plus it's made in the U S A , allegro medical is my only place to buy this product. I was looking for a y-tube adapter. This was the exact replacement. This y port is necessary for my daughter's g tube, all syringes fit best with it. great price. great priceno prescriptio. I have a peg tube for feeding using drip bags. I ordered a replacement y connector and the one that I received was for a smaller plastic tube. Are there different sizes? I think they put in a slightly bigger tube due to have to have meds got through it. There must be different sizes. My husband has a feeding tube that is bolus fed and the y port feeding tube adapter that we ordered fit perfectly. I am so sorry I do not know anything about drip feeding thru the tube. We dissolve all the medicine and it goes easily thru the y-tube that we use. I have a peg tube for feeding using drip bags. I ordered a replacement y connector and the one that I received was for a smaller plastic tube. Are there different sizes?